Lieutenant Colonel Charles Gold was Commander Royal Artillery in command of 40 Guns, 15 officers and 290 men. Leamington History Group member David Eason has researched Charles’ life and his role in the Battle of Waterloo. Charles was born in Ireland in 1768, the son of Captain Richard Gold who was later killed at the Battle of Bunker Hill during the American Revolutionary War. He married Ann Kilvington of Warwick and they had three sons (who all became soldiers) and two daughters. At the Battle of Waterloo on Sunday June 18, 1815, after heavy rain it broke into a clear day as the British/Allied Lines sounded with the drummer’s beat of reveille at 4.30am. The first shot fired was from British Artillery upon the French Infantry as they advanced on ‘Hougoumont’ on the French left flank. During the advance of the 2nd Division in the afternoon a French howitzer shell penetrated an ammunition wagon of Charles’ command and exploded its cargo. Few men were hurt, but the horses were horribly mutilated and galloped madly about the field. Later, in a last-ditch attempt to beat the British before turning onto the Prussians, Napoleon sent in his Imperial Guard which advanced upon the British centre. Several regiments of the Imperial Guard Cavalry attacked the 2nd Division. Charles’ guns turned on the Old Guard as it advanced up the ridge, but the Old Guard, even though rocked, stood their ground until the Duke gave the order; “Put every gun to them Sir”. The Middle Guard was stopped, and began to retreat which ended up as a rout, spreading throughout the French Army as the Old Guard was completely destroyed to a man where they stood. Charles survived the battle and was mentioned in despatches. He was appointed a Companion of the Bath on the recommendation of the Duke of Wellington. Charles retired his commission in December 1827 due to bad health. It is believed that shortly after his retirement Charles took up residence in Leamington and, according to the 1841 census he, was living with his daughter Mary in Newbold Road. 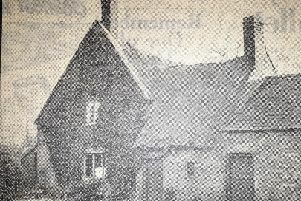 The residence was a lodging house, kept by 53-year-old Elizabeth Bate and two servants. Charles died there on Sunday April 17, 1842, after a long illness, aged 73. He was buried by the Rev John Craig at All Saints parish church. By 1838, the churchyard was full and a piece of land in New Street was purchased for burials. The land has since been cleared and the headstones placed against its perimeter.